I seem to be on a bit of a Compass Box roll… til date have sampled: Asyla, Great King’s Cross Artist’s Blend and Glasgow Blend, Juveniles, Spice Tree, The Peat Monster… and now Hedonism. This sample came compliments of the Canadian stash from my aunt and uncle – fellow whisky aficionados with their own whisky tasting group running for more than a decade. Interestingly, we had the dregs of another bottle of Hedonism passed around at the end of our August Whisky Ladies session. It had been transferred into a small glass jar… and I found the coconut oil so predominant we actually speculated whether the container may have contaminated the sample. Clearly it had not as this one from my aunt and uncle had that same quality. In some ways, it reminded me of my first foray into the land of single grain whisky from Chita. Yet while the Chita is quite ‘technical’ in its soft, delicate, floral nature, Hedonism has more of an ‘edge,’ there is personality peaking through that coconut and a sense of age. I wanted to love it as I do many Compass Box offerings. I was pre-disposed to find it delightful. It isn’t. Do I like it? After a bit of warming up and aligning to its special qualities… yes! Would it be 1st priority for future purchasing? Perhaps not but it is absolutely worth trying if you get a chance. Flavour Descriptors – Elegant flavours of vanilla cream, toffee, coconut. Recommendations – As an aperitif, serve with a small amount of chilled water. Late in the evening, serve neat. Also makes a great whisky sour. Distillery Sourcing – Will vary according to batch but typically whiskies from the following distilleries: Cameron Bridge, Carsebridge, Cambus, Port Dundas or Dumbarton. Wood – 100% first-fill American oak barrels or rejuvenated American oak Hogsheads. Bottling Details – 43%. Not chill filtered. Natural colour. 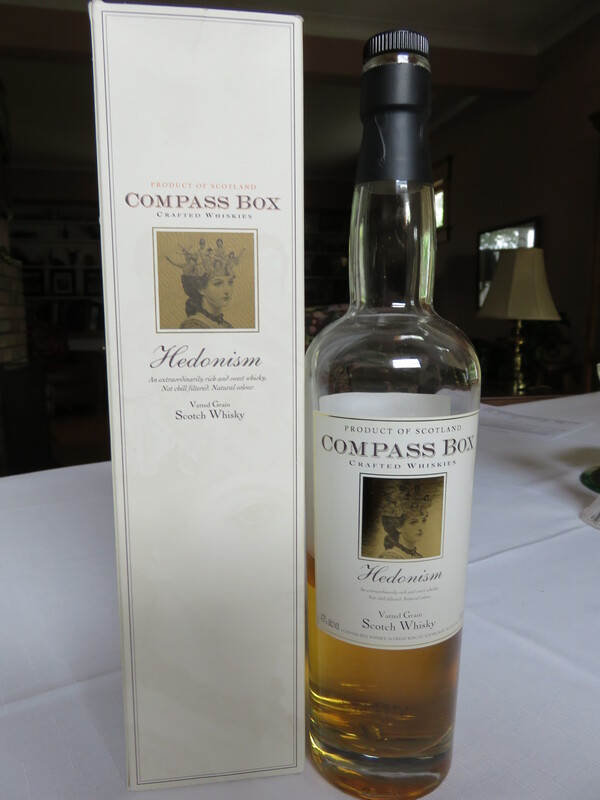 This entry was posted in Blends, Scotland and tagged #WhiskyReview, #WhiskyWomen, Compass Box, Compass Box Hedonism, Compass Box Hedonism tasting notes, Hedonism, Whisky ladies by Carissa Hickling. Bookmark the permalink.